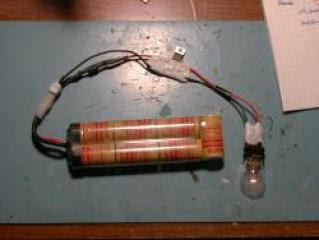 This is a precision battery discharger for 8.4V 7-cell Ni-Cad or Ni-MH batteries. It's cheap, reliable discharger circuit with an easy visual indication of the battery’s state (discharging or discharged) with less than 10$ of parts. Most parts can be found around the house or taken from broken electronic equipment or purchased from Radio Shack. The circuit as shown only works with 7-cell (8.4V) NiCd or NiMH battery packs, but with a couple additional parts it can also work with 8 cell 9.6V packs..